There are no warranties (including any of merchant ability) that extend beyond the following. Brave Industrial Fastener, Inc. warrants its fasteners to be free from defects in material and manufacturing. 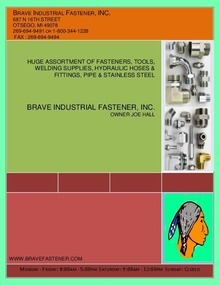 Brave Industrial Fastener, Inc., liability is limited to the purchase price of this product. All metal fasteners have the potential to corrode. Fasteners used in corrosive environments and materials require higher levels of corrosion resistance. When used in accordance with the design limits and the structural, technical, and environmental specifications. Delays: Brave Industrial Fastener, Inc. shall not be liable for any loss or damage resulting in delays in filling this order, whether due to strikes, fires, accidents, transportation delays, shortages of raw materials or equipment failures, or to any other reason beyond its control. Brave Industrial Fastener, Inc. will use its best efforts to deliver the products within the shipment period agreed upon. Failure to deliver or delay in delivery of any installment of an order for any reason shall not affect the obligations of the parties with respect to the balance of the order. Brave Industrial Fastener, Inc., reserves the right, in the event of a product shortage, to allocate its production and shipments among customer on such basis as it considers appropriate. Returns: Products shall not be returned without prior approval of Brave Industrial Fastener, Inc. All returns shall be in accordance with instructions given by Brave Industrial Fastener, Inc.
Limited Warranty: Brave Industrial Fastener, Inc., warrants that all products shipped against this order will conform to specifications and drawings submitted and that such products will be manufactured and inspected according to generally accepted applicable practices of companies manufacturing industrial fasteners. This warranty is made in lieu of all other warranties, express or implied, including warranties of merchantability and fitness for a particular purpose. This warranty is void unless customer notifies Brave Industrial Fastener, Inc., of any rejections based on non-conformity to specifications of/or defects in the products within 90 days after receipt thereof by customer. Brave Industrial Fastener, Inc. will have the right to inspect rejected products at the delivery point within 15 days after its receipt of customer’s notice of rejection. This warranty does not apply to any products, which are reworked or subjected to any type of additional processing by customer. Limitation of Liability: Customer’s remedy hereunder shall be limited to the repair or replacement of the products rejected or refund of the purchase price thereof, at the option of Brave Industrial Fastener, Inc. Under no circumstances will Brave Industrial Fastener, Inc., be liable hereunder for incidental or consequential damages such as, but not limited to damage of loss of other property or equipment, loss of profits or revenue, loss to use, cost of capital or claims of customer’s customers; or for expenses incurred by customer or a subsequent user in repairing or replacing the rejected products. Title: risk of loss: Title to the products will pass to customer upon delivery of the products to a carrier for shipment to customer, after which time customer will bear all risk of loss of or damage to the products. Notwithstanding the foregoing, Brave Industrial Fastener, Inc., reserves the right at any time prior to delivery to customer to reconsign the products and/or to change the terms of payment therefore, whenever, in its judgment, doubt arises as to customer’s financial responsibility. We assume no Liability for any loss of or damage to merchandise or material while in transit to or from our warehouse, whether in trucks or vehicles owned by us, the customer or any third person acting in our or the customer’s behalf. General: It is recognized that even after employing all the scientific methods known to us, hazards still remain in cold forming and/or machining parts. The provisions of this acknowledgment, which include the terms and conditions of sales, constitute the entire agreement between parties with respect to the subject matter thereof, and such agreement supersedes all previous bids, offers, negotiations, representations and other communications, both oral and written, between the parties. Such agreement may not be changed or supplemented, nor may any provision thereof be waived, except by an instrument in writing signed by a duly authorized representative of each of the parties. Specifically, the terms and conditions of sales set forth in this acknowledgement may not be changed, modified or expanded nor otherwise affected by the provisions of any purchase order or other instrument furnished by customer, irrespective of whether there is a conflict between these terms and conditions of sales and those contained in any such purchase order or other instrument of customer. No agent, representative or employee is authorized to alter these conditions, except by written agreement and signed by an officer of Brave Industrial Fastener, Inc. The customer agrees to accept the limits of liability as expressed in this statement to the exclusion of any and all provisions as to liability on the customer’s own invoices, purchase orders or other documents. If the customer desires his own provisions as to liability to remain in force and effect, this must be agreed to in writing, signed by an officer of Brave Industrial Fastener, Inc. In such event, Brave Industrial Fastener, Inc. shall determine a different charge for our services, reflecting the higher risk to Brave Industrial Fastener, Inc. and the customer. Customers may bring no suit or action against Brave Industrial Fastener, Inc. unless brought within twelve months after a claim arises. Customer agrees Brave Industrial Fastener, Inc. will have no liability in contract or tort for any special, indirect or consequential damages, arising from any reason whatsoever, including but not limited to personal injury, property losses, loss of profits, loss of production, recall inspection, repair costs or any other losses, expenses or liabilities allegedly occasioned by the work performed on the part of Brave Industrial Fastener, Inc. It shall be the duty of the customer to inspect the merchandise immediately and prior to any further processing or assembly, and in any event claims must be reported prior to the time that any further processing, assembling or any work is undertaken. Our liability to our customers shall cease once any further processing; assembling or any other work has been undertaken on said material. Until the purchase price of the goods and services purchased hereunder and all other amounts owing from the buyer to seller are paid in full, seller retains and buyer grants seller a security interest in the goods described on the face hereof and in any other goods now or hereafter delivered to seller by buyer and in all proceeds of said goods. Buyer shall execute financing statements on request to evidence such security interest and hereby irrevocably appoints seller as its attorney-in-fact with authority to execute and file same on buyers behalf of claims for shortage in weight or count will be entertained unless presented within five (5) working days after receipt of materials by the customer. Whenever we are given material with detailed instructions as to cold forming or machining our responsibility shall end with the carrying out of those instructions. Payment terms are net 30 days from date of shipment. Brave Industrial Fastener, Inc., reserves the right to charge one and one half percent (1.5%) interest per month until any past due payments are paid in full. If customer requires product to be free of any foreign material, the customer must request a separate quotation for sorting and issue a purchase order for sorting. Please call with any questions on products! We would be happy to check our inventory for you! All your supplies in one stop! Tank Exchange for all welding & cutting gases. New tanks are also available. Mig & Tig Rod, regulators, helmets, carts, protective sleeves and clothing, face shield lens, flux paste and so much more.